After years of neglect in many American parishes, chanted Mass propers are making a comeback, thanks in part to new online resources. The publication of the new English translation of the Roman Missal has helped revive interest in the use of chant in the ordinary form of Holy Mass. The Roman Missal includes many more chanted texts than did the previous edition, allowing clergy and people alike to “sing the Mass, rather than merely to sing at Mass,” as Msgr. Andrew Wadsworth, executive director of the ICEL (International Committee on English in the Liturgy) Secretariat, said in a 2010 address. The new Roman Missal includes a new translation of the General Instruction of the Roman Missal (GIRM), which also has fostered greater interest in chant. Citing Sacrosanctum Concilium (the Second Vatican Council’s Constitution on the Sacred Liturgy) and subsequent curial documents, the GIRM states that “the main place should be given, all things being equal, to Gregorian chant, as being proper to the Roman Liturgy.… Since the faithful from different countries come together ever more frequently, it is desirable that they know how to sing together at least some parts of the Ordinary of the Mass in Latin, especially the Profession of Faith and the Lord’s Prayer, according to the simpler settings” (nos. 41-42). When Catholics think of Gregorian chant at Mass, many tend first to think of chants associated with the Ordinary of the Mass—that is, the parts of the Mass that tend not to vary from day to day—for example, the Kyrie, Gloria, Profession of Faith (Credo), Sanctus, and Agnus Dei. But there is also another set of chanted prayers at Mass: the propers, that is, five chants that are proper, or specific, to each Mass. The past two years have witnessed a revival of interest in the propers in parishes in the English-speaking world. In the Roman Missal (the liturgical book used by the priest at the chair and at the altar), there are proper antiphons and prayers for Masses on different days of the liturgical year: the Entrance Antiphon, Collect, Prayer over the Offerings, Communion Antiphon, and Prayer after Communion. The texts of the five chanted propers, however, are found not in the Roman Missal, but in another liturgical book, the Graduale Romanum (used by the schola cantorum, or choir), which, like the Roman Missal, was revised after the Second Vatican Council. In his work The Reform of the Liturgy 1948–1975, published posthumously in Italian in 1983, Archbishop Annibale Bunigni, who served as secretary of the Consilium for the Constitution on the Sacred Liturgy (1964-69) and secretary of the Congregation for Divine Worship (1969-75), recounted that the Consilium entrusted the revision of the books of Gregorian chant to the Abbey of St. Peter of Solesmes, the French Benedictine monastery that has been a center for chant studies since its re-founding by Dom Prosper Guéranger in the 1830s. A revised Graduale Romanum was issued in 1974, and its introduction discusses the differences between the preconciliar and postconciliar editions. The abbey of Solesmes has also published the Gregorian Missal, which contains the Order of the Mass in Latin and English, as well as the five proper chants of the Mass (from the Graduale Romanum) and the proper prayers for the Mass (from the Roman Missal) for Sundays, solemnities, and feasts of the Lord. The five chanted propers in the Graduale Romanum are the introit (entrance chant), gradual, Alleluia, offertory, and Communion chant. The gradual holds the same place in the Graduale Romanum as the responsorial psalm does in the Lectionary. During Lent, the tract replaces the Alleluia chant, and during Eastertide, there are two Alleluia chants, the first replacing the gradual. At times, the texts of the introit and Communion chant for a particular day in the Graduale Romanum differ from the texts of the Entrance Antiphon and Communion Antiphon on that same day in the Roman Missal, and the text of the Alleluia for a particular day in the Graduale Romanum at times differs from the text in the same day in the Lectionary. The Graduale Romanum is not the only official liturgical book containing chants for use at Mass. Following the Second Vatican Council, the Graduale Simplex was developed by the Consilium in collaboration with the monks of Solesmes. The Graduale Simplex, issued in 1967 and revised in 1974, is the result of Sacrosanctum Concilium’s call for “an edition [to] be prepared containing simpler melodies, for use in small churches” (no. 117). In addition, the United States Conference of Catholic Bishops requested in 2001—and received from Rome in 2002—the permission to allow for the singing of the Entrance Antiphon and Communion Antiphon from the Roman Missal. In the Church’s liturgical discipline, these two antiphons are typically intended for recitation when there is no singing (GIRM, nos. 48, 87). (1) the antiphon from the Missal or the antiphon with its Psalm from the Graduale Romanum, as set to music there or in another setting; (2) the antiphon and Psalm of the Graduale Simplex for the liturgical time; (3) a chant from another collection of Psalms and antiphons, approved by the Conference of Bishops or the Diocesan Bishop, including Psalms arranged in responsorial or metrical forms; (4) another liturgical chant that is suited to the sacred action, the day, or the time of year, similarly approved by the Conference of Bishops or the Diocesan Bishop (no. 48, cf. no. 87). Cantus, the Latin word translated as “chant” in the fourth option, means “that which is sung,” Father Richard Hilgartner, executive director of the USCCB’s Secretariat for Divine Worship, told Catholic News Service in 2011, thus allowing for the singing of hymns—an option permitted in Musicam Sacram, the 1967 curial instruction on sacred music, which described hymns as a “custom legitimately in use in certain places and widely confirmed by indults” (no. 32). In many parishes, this last option from the GIRM—the singing of a hymn—is the sole option at the entrance and at Communion that parishioners have experienced for several decades. Likewise, at the offertory, few Catholics have heard the option of an offertory chant from the Graduale Romanum, with most parishes legitimately singing a hymn instead (GIRM, no. 74). After the first reading and before the Gospel, most parishes use the Responsorial Psalm and Gospel acclamation from the Lectionary, rather than the chants from the Graduale Romanum or Graduale Simplex, which are also legitimate options (nos. 61-62). Most parishes in the English-speaking world, then, find themselves in a curious position at this juncture in liturgical history. On the one hand, the Church teaches that within the context of the ordinary form of the Mass, “the main place should be given, all things being equal, to Gregorian chant, as being proper to the Roman Liturgy” (GIRM, no. 41). On the other hand, another option, also legitimate, has become ingrained in the practice of most parishes. Msgr. Wadsworth paid tribute to the Church Music Association of America for its work in making the Mass propers more accessible. Jeffrey Tucker, the managing editor of the CMAA’s quarterly journal, Sacred Music, told CWR that “the realization of the role of propers came only in the last few years” and helped overcome debates between proponents of different hymns. 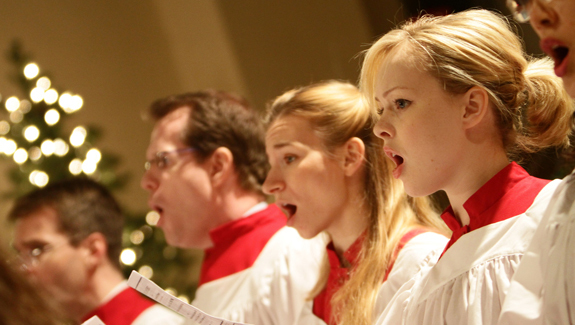 “We are certainly experiencing a Gregorian chant renaissance in our day, and we are very blessed to see a flowering of new musical resources that find their inspiration in the inestimable treasures of sacred music which the Second Vatican Council spoke of and exalted,” says Bartlett, director of sacred music at Saints Simon and Jude Cathedral in Phoenix. many parishes are not yet ready to take on the full singing of these chants in their Latin settings, and it is for this reason that both the Simple English Propers (SEP, 2011) and the Lumen Christi Missal (LCM, 2012) were developed and published. The SEP sets the text of the Graduale Romanum, in English translation, for the entrance, offertory, and Communion for Sundays and feasts and is intended for beginning and average parish choirs to undertake the singing of the full proper of the Mass in simple musical settings that can be sung effectively each week. The LCM, however, is a book for Catholics in the pew, and it provides for them (among many other things) a repertoire of sung propers in English that can be sung by ordinary parish congregations with a sensitive and gradual introduction and with good catechesis. Father Weber, a Benedictine who is currently stationed at St. Eugene’s Cathedral in Santa Rosa, California and whose works are available online, told CWR that he is working on three books that will be published by Ignatius Press: The Propers of the Mass for Sundays and Solemnities, The Sunday Vesper Book for Parishes, and The Book of Responsorial Psalms, Gospel Acclamations, and Sequences for Sundays and Solemnities. Pluth and some of the other musicians and liturgists contacted by CWR recommend that any parishes that wish to implement the propers do so over time. “Whatever one’s preferences among these options might be, any decision should not be made based on one’s personal preferences, but on the common good of the whole parish and in dialogue with the appropriate members of the parish—for example, the music director, members of the choir, members of the liturgical committee,” adds the USCCB’s Father Merz.